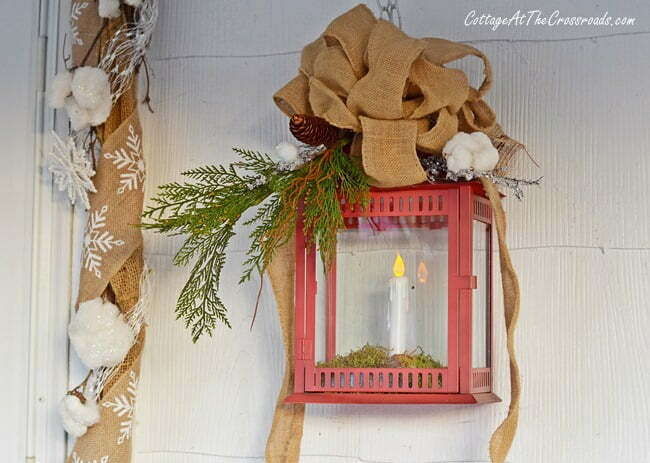 Today I’m sharing how I’ve decorated for Christmas on the front porch. 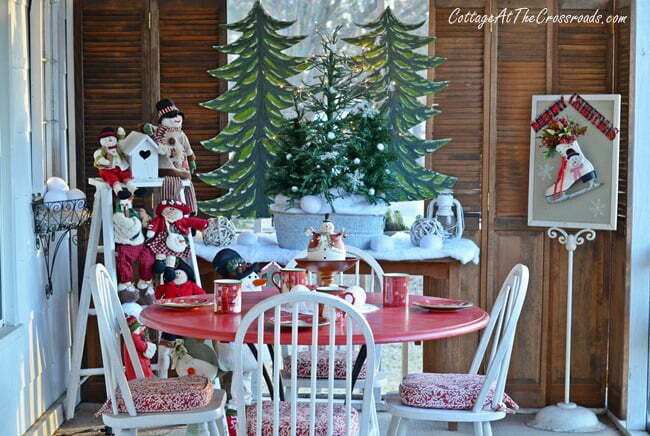 It’s my favorite space to decorate for the seasons, especially Christmas! 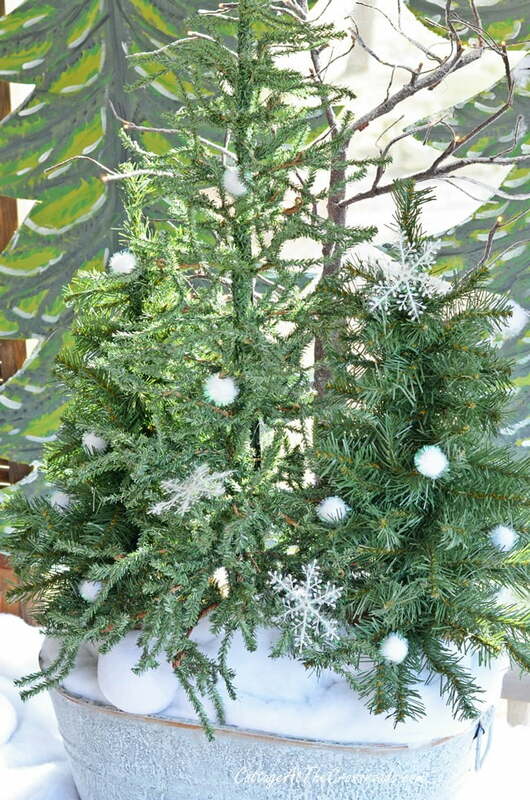 The porch decorating started back in November when Leo and I made these DIY Wooden Christmas Trees. 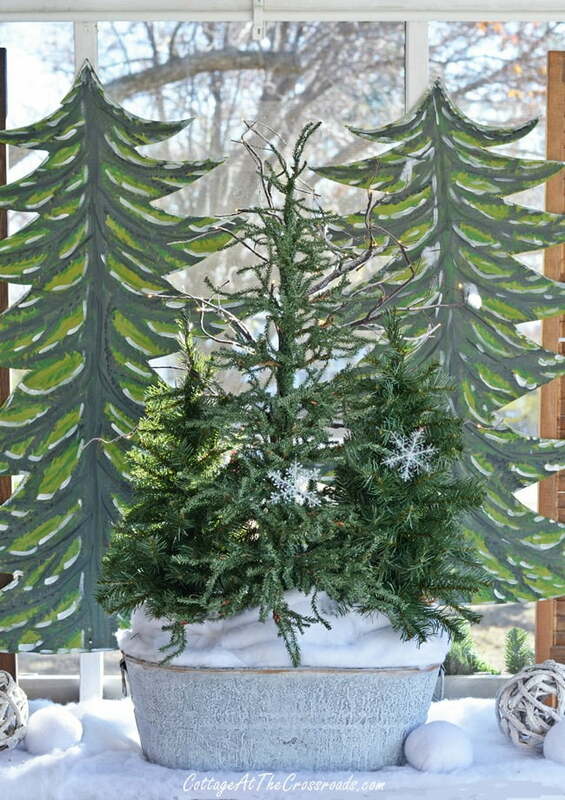 They are behind 3 smaller artificial trees that I put in a galvanized container. There’s a bed of snow on the table as well as some snowballs. 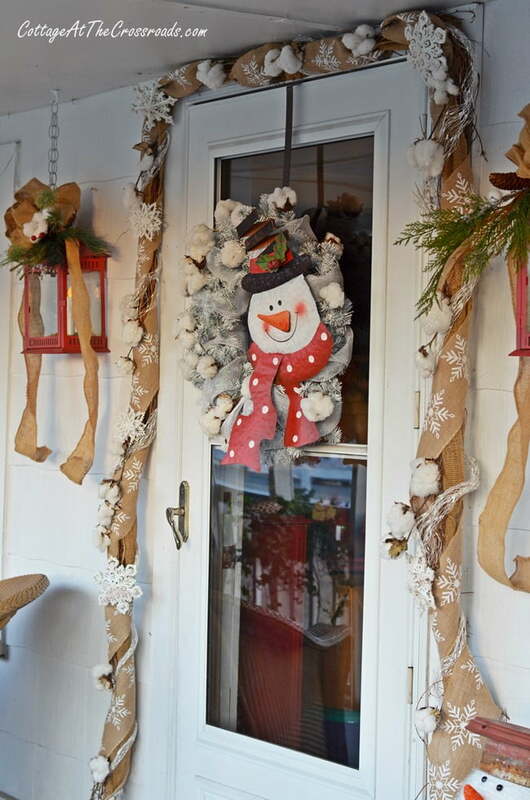 This whole scene at this end of the porch sets the stage for a winter wonderland on the porch. You see, here in the South we rarely see snow, and we’re fascinated by it! And I have NEVER seen a white Christmas. So I set out to create my own this year! 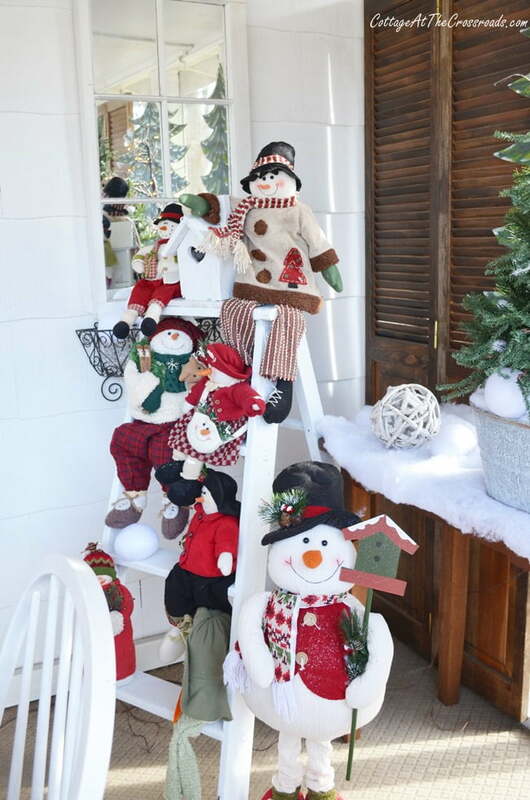 And you can’t have a winter wonderland without… SNOWMEN! So I gathered my collection and put them on an old wooden ladder. I love how the trees and the snowmen are reflected in the mirror. We have a table on this end of the porch, and it’s set for snacks. 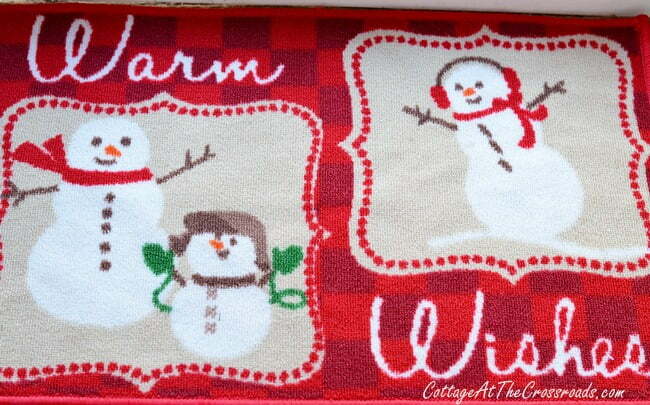 Perfect for some hot cocoa and cookies! 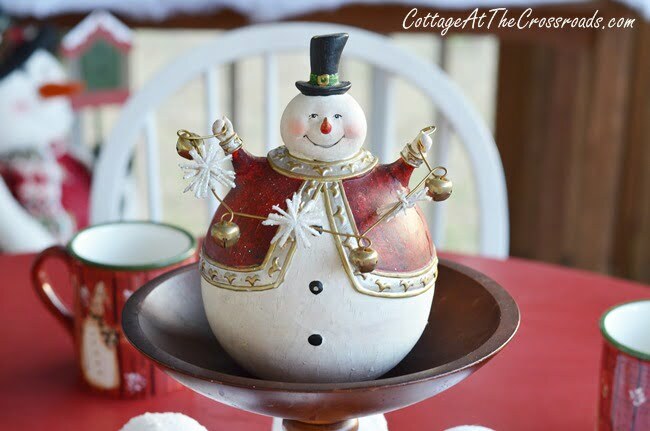 The centerpiece contains one of my all-time favorite snowmen-this chubby fellow! I would have put him a little bed of snow in the pedestal bowl, but I was afraid that it would blow out! The skate that I hand-painted last year is hanging on the stand that’s always on the porch. Around the front door is the grapevine garland that’s been up now for 3 Christmases. You can see all the ways it’s been decorated in the post Grapevine Garland Through the Seasons. 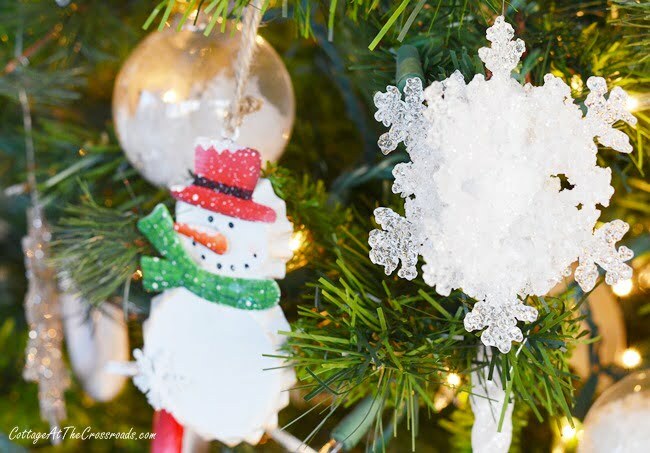 This year i added a snowflake burlap ribbon, some large snowflake ornaments, and some real cotton that I glitterized! They really do look like puffy snowballs! Here you can see them a little better along with the red lanterns that we added last year. I always have an old milk can sitting underneath the lantern on the right, and this year I turned him into snowman! On a little table are our dancing frogs. On second thought, I could have turned them into snowmen, but I just plopped these Santa hats onto them the way I always do! On the other end of the porch is our sitting area. Yep! You guessed it. 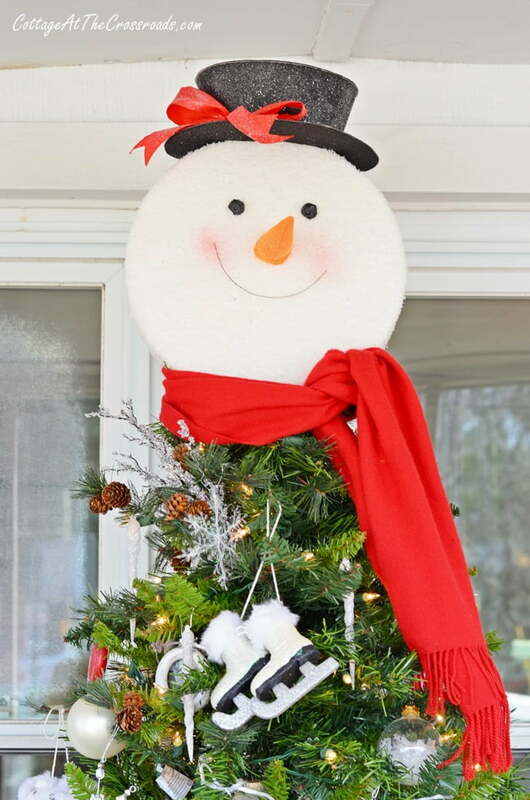 There’s a snowman tree on this end! Love the skate ornaments on the tree. It’s loaded with more snowmen and snowflake ornaments. 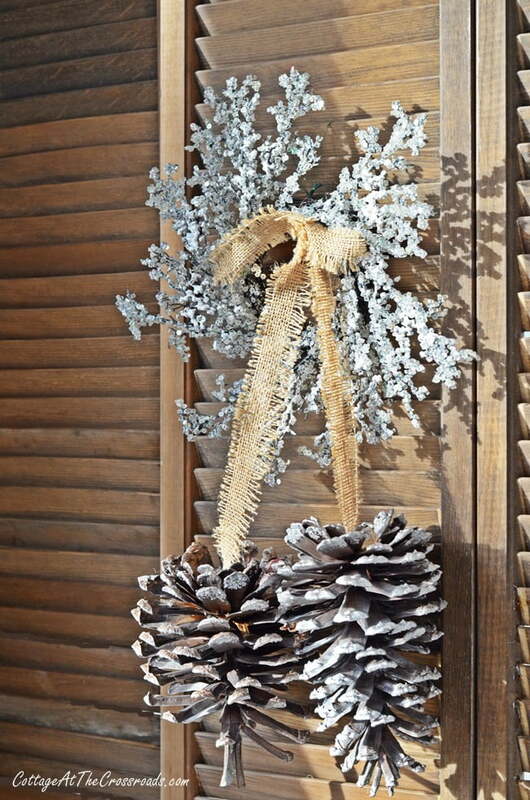 On the old closet doors turned into shutters are 2 frosty wreaths with pine cones hanging from them. None of this is new-just part of my stash that I combine in a new way each year. The only new thing on the porch is this snowflake throw that I found for a song at Ross’ in the porch’s colors. 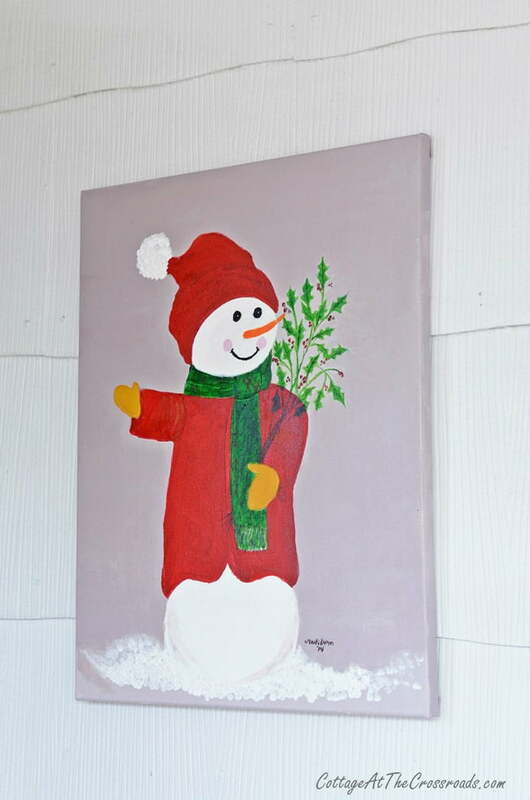 My friend Marti gifted me with this snowman that she painted last month. Isn’t he just the cutest thing! Are any of you as crazy about snowmen as I am? On a little table is a plate that I got for free at the auction. Sometimes people buy a lot but don’t want everything so they just leave it behind. SCORE! I hope you’ve enjoyed our porch tour. In front of the screen door is a rug containing my sentiments right now. I’m sending all of you WARM WISHES for the holidays! Beautiful and very festive porch! 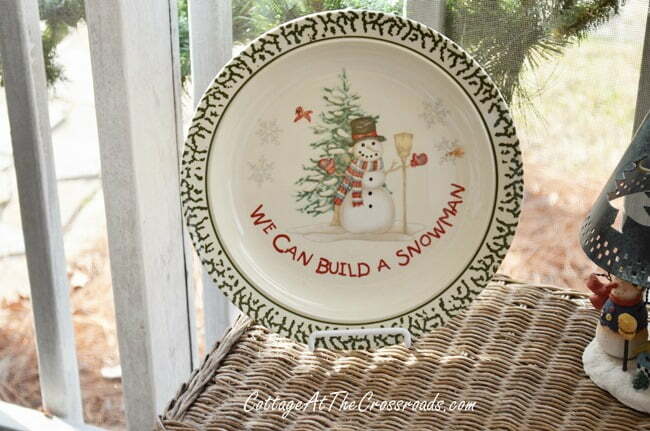 I love all your snowmen decorations and plates! Have a wonderful Thanksgiving and a very Merry Christmas! Happy to see all of your snowmen words can’t express theyre so lovely …. Like you i am madly in love with those cutie fellow…. 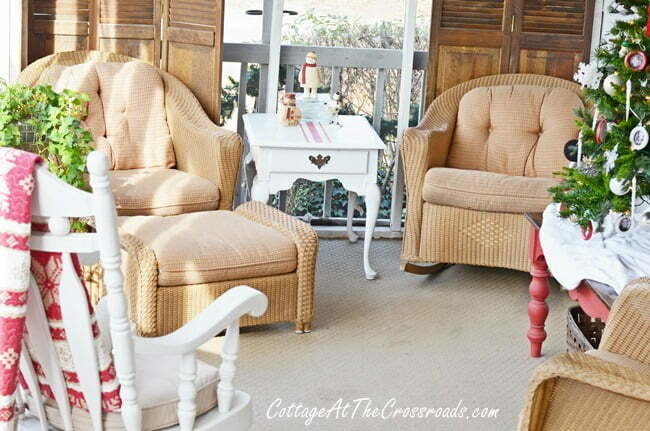 Love your porch…Always so homey and comfy….makes me want to visit and sit a while! Merry Christmas and Happy New Year, Jane! Merry Christmas Jane. Me and Lucy love you. So beautiful! Love it!! Merry Christmas! Dancing frogs and ice skates -what could be merrier! Wishing you both a very merry Christmas and a very jolly 2015! Hi, Jane, your Christmas decor is so nostalgic and fun, takes me back to a simpler time that we all grew up with. Hope you and Leo have a wonderful Christmas this year. I’m so enjoying this week of relaxation with the family and just enjoying all the season has to offer. 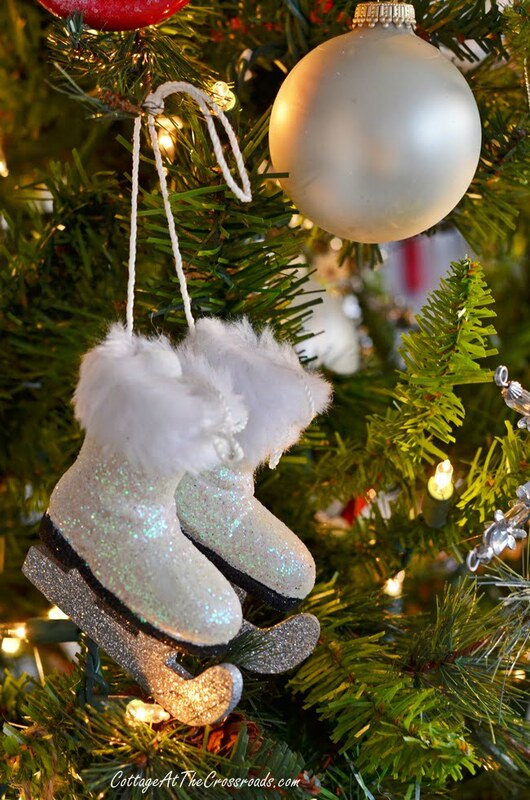 Merry Christmas and Happy New Year to 2 of the sweetest people in blogland! Jane, don’t know how I missed this post. I always love to see how you decorate your porch. Super cute this year. 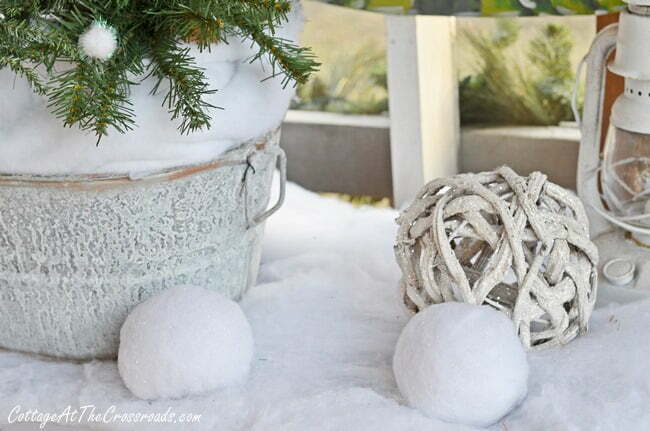 Love the snowballs. Merry Christmas to you and Leo! Just beautiful! So cozy! I’ll be right over for a hot cocoa-I’ll bring the cookies! What an amount of work went into this Jane. I hope that front porch is heated……..all that snow makes it look like it could be chilly! 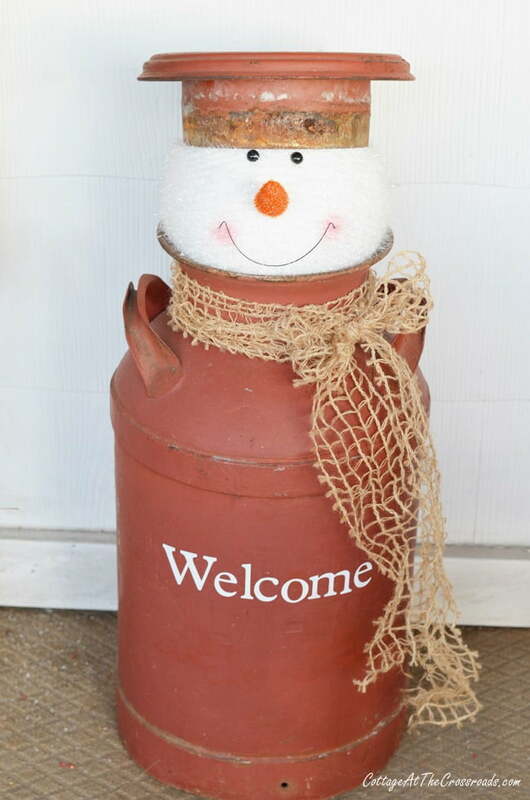 Oh, I love the milk can Snowman!! I have a milk can from the farm where my hubby grew up. His great-grandfather homesteaded the farm in 1870! I always get excited when I see your front porch. It’s always so pretty and you never disappoint. Another beauty Jane. 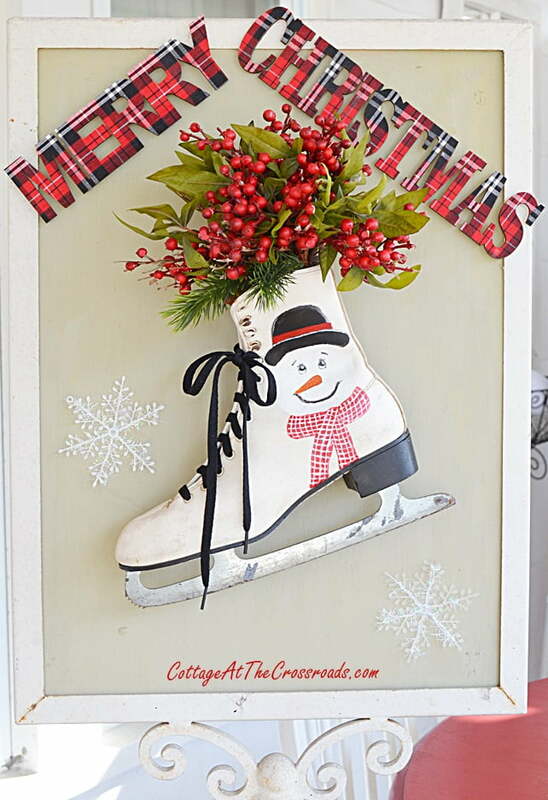 Love the lanterns, tree, skates on the tree and your wreath. Your porch looks wonderful Happy holidays. So adorable. I love it especially the milk can snowman. So clever. 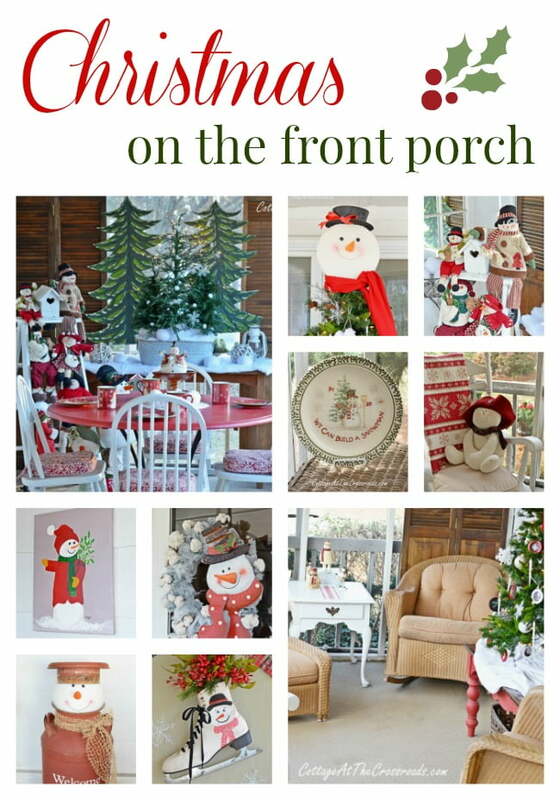 Love your porch all dressed for Christmas. I always love your vignettes you create they are always so pretty. I also love your touch of whimsy in your decor too. Love the dancing frogs tooooo cute. They just make you smile. Merry Christmas. Your front porch is sooo beautiful! 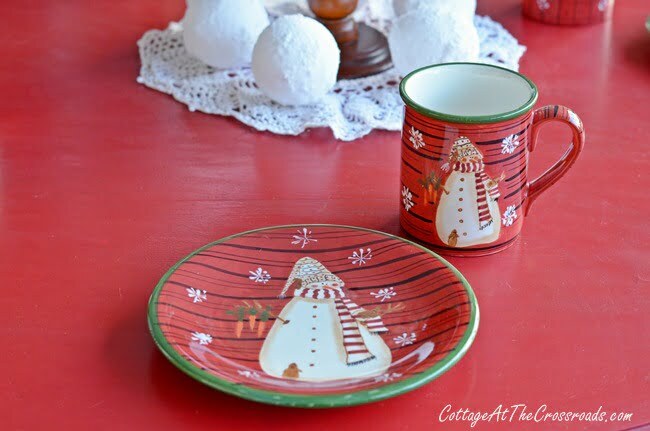 Love the snowman theme! Merry Christmas! 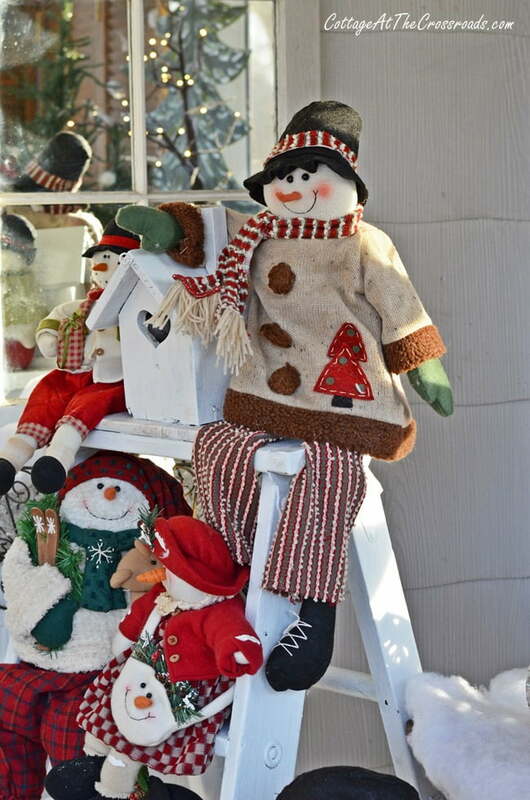 Jane, Your porch is the cutest snowman porch ever!!! 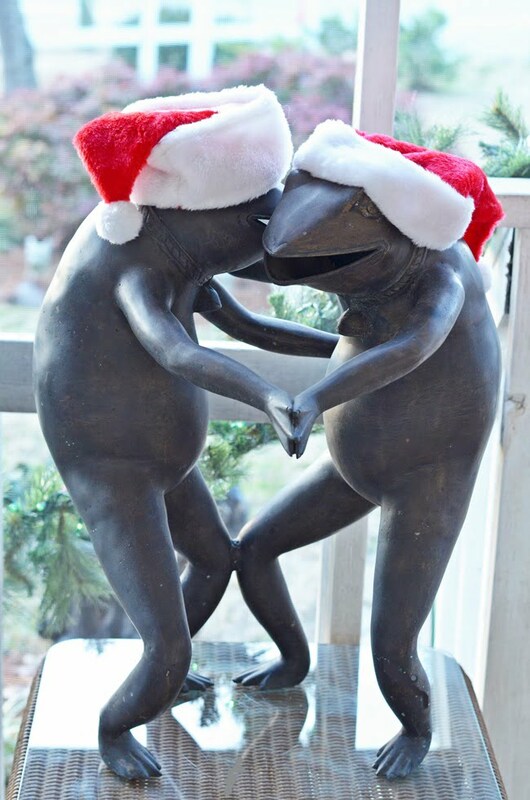 And those dancing frogs in their Santa hats have me giggling, They are so cute! 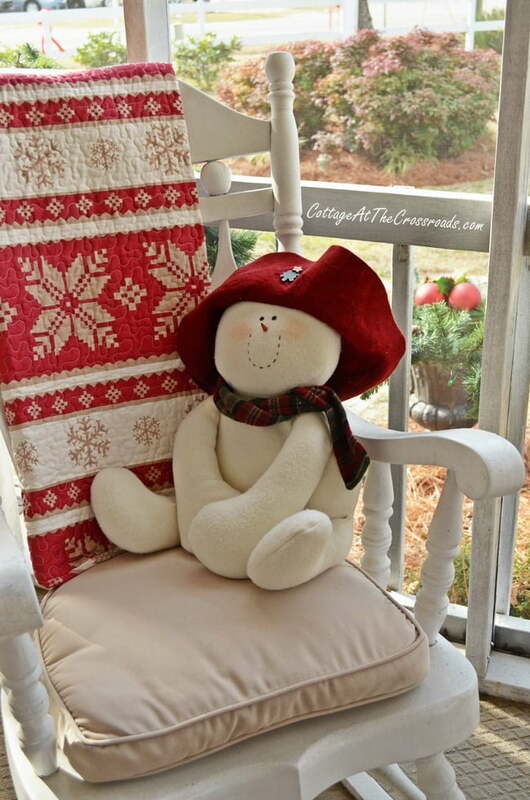 I do my porch in snowmen too, they are my favorite porch decor for the winter.